MoreAt the law firm of Wilson, Stavros, Rowsey & Thomas in Ashland, Kentucky, we are fully committed to providing the highest level of representation possible for all of your most important and pressing legal issues.Serving Boyd, Carter, Greenup, and Lawrence counties and the surrounding areas, the attorneys at our law firm deliver the personalized attention and compassionate support our clients deserve while helping them achieve the results they seek for their serious legal challenges...At the law firm of Wilson, Stavros, Rowsey & Thomas in Ashland, Kentucky, we are fully committed to providing the highest level of representation possible for all of your most important and pressing legal issues. Over the course of our more than 25 years serving the residents of our community both inside and outside the courtroom, we have earned a reputation as a law firm that cares. Not only do we offer unmatched, cost-effective legal counsel, but we also support those less fortunate in our area through our philanthropic efforts and involvement with various civic and charitable organizations. 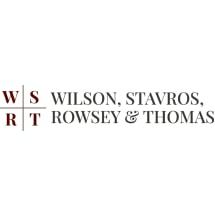 No matter the circumstances surrounding your case or the complexities involved, you can trust the legal professionals at Wilson, Stavros, Rowsey & Thomas to be your dependable legal advocate in your time of need. For more information on how we can best serve you, you can contact our law firm to schedule a free case evaluation. Mon-Thurs 8:30 a.m. - 4:30 p.m., Fri 8:30 a.m. - 12 p.m.